C for Everyone: The JumpStart Guide to C, is part of the JumpStart MicroBox education kit package and also available for standalone purchase. The purpose of this book is to teach the C programming language, using examples running on the JumpStart MicroBox hardware. A college-level course syllabus can be constructed around this book and its examples, suitable for both hardware and software engineers. 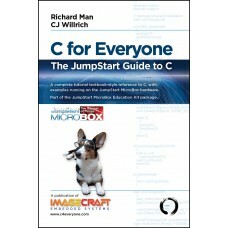 If you are purchasing the JumpStart MicroBox education kit, you do not need to purchase this book separately. Sample chapters of the book are available on Amazon. The book starts off with an introduction chapter using tutorial examples, after which the elements of the C language are presented in a methodical and logical manner. The authors have over 30 years of experience of writing C compilers and interacting with customers, and special attention is given to topics that may not be obvious to users with only "usage experience" with the language. “Can you learn C from this book without the MicroBox hardware?” The answer is undoubtedly Yes! Section II, The C Programming Language, is a concise practical introduction to the C language. Reading through this section alone will give you a good understanding of the language. So, whatever platform you are using C on, you may peruse the examples and text, and “type away”.